Panel grouping together the vehicle operation indication dials and warning lamps. Indicates the engine speed (x 1 000 rpm). Indicates the temperature of the engine coolant (°Celsius). Indicates the current speed of the moving vehicle (mph or km/h). 6. Display zero reset or service indicator re-display button. Resets the selected function to zero (trip distance recorder or service indicator) or displays the service indicator again. 7. Instrument panel lighting dimmer. 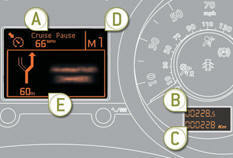 Adjusts the brightness of the lighting of the instruments and controls, if the vehicle lighting is on. For more information, refer to the section corresponding to the button or function and its associated display. (mph or km/h) B. Trip distance recorder. (miles or km) C. Service indicator. (miles or km) D. 6-speed electronic gear control or automatic gearbox. E. Warning messages and function status messages, trip computer, GPS navigation information. - When stationary , configuration of the vehicle's equipment and the screen settings (languages, units...), - While driving , scrolling of the active functions (trip computer, navigation...). 1. Access the main menu, confirm the selection. 2. Move up through the menu. 3. Move down through the menu. 4. Return to the previous display, exit from the menu. The main menu and its associated functions can only be accessed when stationary, via buttons 1 to 4 . A message appears in the screen, above a certain speed threshold, indicating that the main menu cannot be displayed. 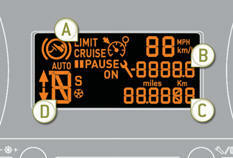 The trip computer displays can only be accessed while driving, via buttons 2 and 3 (refer to the "Trip computer" section). Press button 2 or 3 to move in the screen. Press button 1 again to confirm the selection. 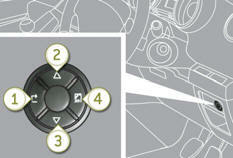 - automatic or manual parking brake (refer to the "Driving" section). This menu allows you to select the display language: Deutsch, English, Espanol, Français, Italiano, Nederlands, Portugues, Türkçe * . 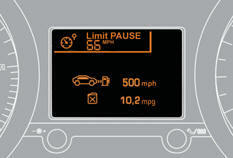 This menu allows you to select the units: temperature (°Celsius or °Fahrenheit) and fuel consumption (l/100 km, mpg or km/l).